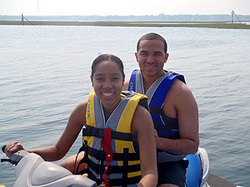 Jet Ski on Cape Cod! Lowest Rates for the Newest Wave Runners Available! Our brand new fleet of Yamaha VX-1100 WaveRunners® run out of the Parker River and into the beautiful Nantucket Sound in South Yarmouth on Cape Cod. We have brand new jet skis! What does that mean for you? 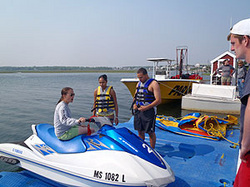 The fastest, most reliable jet ski rentals on Cape Cod. Nantucket sound is the perfect venue for exciting waves and top speeds. Or just take a slow cruise around enjoying the warm water and beautiful sun! It's up to you! We operate on the south side of the Cape where waters are consistently 10+ degrees warmer than Cape Cod Bay on the north side. This warm shallow water is calm and the ideal setting for all your watersports fun! Our jet docks make getting on and off your skis a breeze! Full instructions! Anyone can jet ski regardless of experience! A great gift! Best vacation memories! Our rentals offer a beautiful tour of the Parker River followed by fast and free running in Nantucket Sound! You must be 18 or older to rent a jet ski by yourself. However, any age can ride along so grab an adult and come on down! 16 and 17 year olds can ride solo with a boating license! Jet skis fill up quickly so call ahead for reservations - 508-398-7245!